Did the father of church history lie? Let’s plunge into the Deeper Waters and find out. So says Dan Barker about Eusebius. Now this is naturally a serious charge if it is true, but is it in fact true? Well, not really. For one thing, the description comes from a chapter heading. The heading could have come from Eusebius, but not necessarily. It could have been a summation by a medieval copyist of what Eusebius wrote. Still, even if we grant it, do we have a dangerous case? Well no. In fact, if you just spend a few minutes looking up quotes, you can see what’s going on. Let’s go and see what Eusebius said in the chapter in entirety. [PLATO] ‘But even if the case were not such as our argument has now proved it to be, if a lawgiver, who is to be of ever so little use, could have ventured to tell any falsehood at all to the young for their good, is there any falsehood that he could have told more beneficial than this, and better able to make them all do everything that is just, not by compulsion but willingly? Yes. That’s the entire chapter. Note that this is not at all about creating history. Eusebius writes about the Old Testament and I don’t know any skeptic who thinks Eusebius created that. (But hey, give it time and I’m sure someday some crazy skeptic will say that.) So what is going on? Eusebius is writing about the use of anthropomorphisms in the Old Testament and saying that although these descriptions of God aren’t literally true, they can be helpful for those who need to be instructed in this way. Note that this does not mean it is a lie. It means it’s being explained in terms that can be understood. We should not expect the Old Testament to be the Summa Theologica for instance. In fact, we have a parallel to this saying. That shows up in the Contra Celsum of Origen. Others, then, may concede to Celsus that God does not undergo a change, but leads the spectators to imagine that He does; whereas we who are persuaded that the advent of Jesus among men was no mere appearance, but a real manifestation, are not affected by this charge of Celsus. We nevertheless will attempt a reply, because you assert, Celsus, do you not, that it is sometimes allowable to employ deceit and falsehood by way, as it were, of medicine? Could this then be a sort of saying at the time? It’s possible. We don’t have enough evidence. Note in all of this, we’re not likely talking about lies, but talking about fictions. That is, it is beneficial to tell things that might not be true but serve for edification. Think of the parables of Jesus that don’t necessarily tell of true events, but are edifying, or of Aesop’s fables. So again, we have an example of how modern day atheists too often do not check the original sources. Instead, most of them get in second hand from people who probably never checked either. (Jacob Burckhardt lived in the 19th century for instance.) The church fathers weren’t infallible and they needed a savior like we do, but always ask the person who gives a quote where it comes from and find it in its original context. Posted on 22nd March 2016 Author Nick PetersCategories Apologetics, Dan Barker, Historical JesusTags Church history, Dan Barker, deceit, Eusebius, falsehood, Godless, lies, medicineLeave a comment on Was Eusebius a Liar? 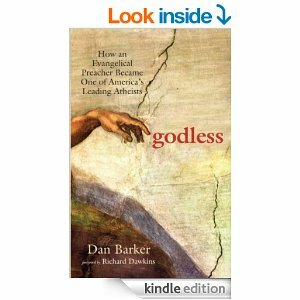 How shall we continue our review of Godless by Dan Barker? Let’s plunge into the Deeper Waters and find out. We now get to the part about Barker’s fall. He starts out by telling us it was 1979 and Jesus still hadn’t returned. (Yes. Barker was caught up in last days madness. Perhaps he could have avoided that had he had access to a work like DeMar’s at the time.) This again is a reminder of the hyper-fundamentalism of Barker. Jesus is returning and well, you know, every other generation was wrong about them being the generation, but we are the ones! Really! Barker is visiting a church and he’s told that there are some members of the congregation that don’t think Adam and Eve were historical people. The pastor doesn’t deny that they’re Christians. This was a shock to Barker who was surprised they were allowed to be members. Barker goes on to describe how some people think some events in the Bible are not fully historical but meant to teach us lessons. Of course, Barker was just thinking it was liberal talk. This experience for Barker would be akin to the experience Bart Ehrman regularly talks about where he got back a paper on Mark 2 trying to deal with what he saw as a Bible contradiction and was told “Maybe Mark just made a mistake.” Now yes, Ehrman says the problem of evil was the real clincher for his deconversion, but it cannot be denied that the breaking down of inerrancy in his mind had a lot to do with it and prepared him for that deconversion. Some of you wonder why it is that I have a problem with inerrancy being treated the way it is in the church as if it was the fundamental doctrine of the church. What happens if the resurrection of Jesus is made your focus? What happens if you can say Jesus rose from the dead even if the Bible is just a collection of ancient documents? Is something like Adam and Eve not being historical going to shake your trust? Nope. Now Barker goes on to say he had read a lot of Christian writers, but had not interacted with the other side at all so he began reading everything he could. Now this part I do not condemn at all. However, there is one danger that I do stress to people. We cannot all be sufficient in every field. There are areas I do not read on because these are not my areas of interest. I do not study them. Oh I know the basics, but I am in no way a specialist. I know enough psychology that I could counsel someone in a pastoral way if need be. I know the basic science that most of us know, but that does not mean I am an authority in these areas. So again, could it be that the lack of education in the church is a problem? People don’t know how to interact with the other side and aren’t prepared in their own side? Barker talks about visiting other congregations and seeing that they can all open the Bible and prove that theirs is the correct interpretation of the text. What it would mean if they could do that is that a text could mean in fact two contradictory things. The person can argue that theirs is the correct one, but proof is something else. What this does is raises the question of “Is there a correct interpretation of the text?” Unless Barker wants to go all postmodern on us (And it’s doubtful he does since he argues later on in the book for what the text says which seems to indicate the text can be understood) then it must be accepted that the text has a meaning. Maybe we don’t know it. Maybe we do. Maybe in some cases there is data missing that we can’t know it. It does not mean the text can mean anything or has no meaning and it does not mean the original recipients would not have understood the meaning. Barker, like many others, uses the “God is not the author of confusion” at this point, though the text is about order in worship and saying when it comes to worship, God is not responsible for confusion. Yes. Barker is still a fundamentalist. He has just switched sides. On page 37, he talks about the fall more saying his experiences did not get weaker and that even today he can produce those feelings that he had. (He also says elsewhere that he can still speak in tongues and just practices every now and then to see if he still has it.) This is a reminder once again that too many Christians are rooting their faith in their own personal experience. Your faith is ultimately all about you then. This is why I get concerned when I meet Christians who only have their personal testimony. That is something that will hamper your evangelism in this day and age. I must agree with my friend Jerry Walls. Why would anyone hope this? Exactly how awful was Barker’s personal God? Later on, Barker says he realized the counter-response to the information he says he was “learning” is just faith. For Barker, faith is a way to believe something. Biblically, faith is really a response to what you already believe. Let’s consider a scholarly source on the matter. It’s noteworthy that Barker admits that while he was an atheist, he was still preaching. To be fair, he did go and get a job doing something else, but it is a concerning issue to know that someone would go on preaching while still being an atheist. Barker talks about being invited to go to Mexico to do some ministry there while still an atheist and while there looking at the stars out the window, he says he realized that he was utterly alone and there was no “supernatural” realm. There was no one watching and judging him. He was all alone in the world in a universe that would burn out after it lost its fuel. All he needed to do was end this with a cute little smiley face. Again, as Walls says, it’s understandable that someone can be convinced this is true intellectually and come to that conclusion with regret, but this strange speak of hope and liberation is just baffling. But thus ends the story of the fall at this point. We’ll look at the fallout next time.